Visit 1 - Between 12-15 weeks of age. Once fully vaccinated they can come in for an introduction session which lasts about half an hour. During this time, they will meet the groomer, and experience the sights, sounds and smells of the salon. They will have gentle handling on the grooming table where they will have their face, ears and feet touched in a positive manner and experience gentle brushing. We can also trim nails at this stage. Obviously lots of cuddles and praise too. This visit is £5 but is refundable off the cost of visit 3. Visit 2 – Between 16-18 weeks of age. This second visit lasts about 1 hour and your puppy can have a bath and be dried in addition to ear and feet care and lots more cuddles and praise. Depending on the breed, your puppy may also need some hair trimming from around his/her eyes. This visit is £10 but is also refundable off the cost of visit 3. Visit 3 – From 19 weeks of age and now that your puppy is happy and relaxed in the grooming salon, they can come in for a full groom where we would carry out some trimming of the coat (if the breed style requires) in addition to ear and feet care and plenty of cuddles and praise. If your puppy has attended visit 1 and/or visit 2, then you will receive a discount off the price of visit which is equivalent to what you have paid for visit 1 and/or visit 2. Otherwise this appointment is charged at the price of a full groom. 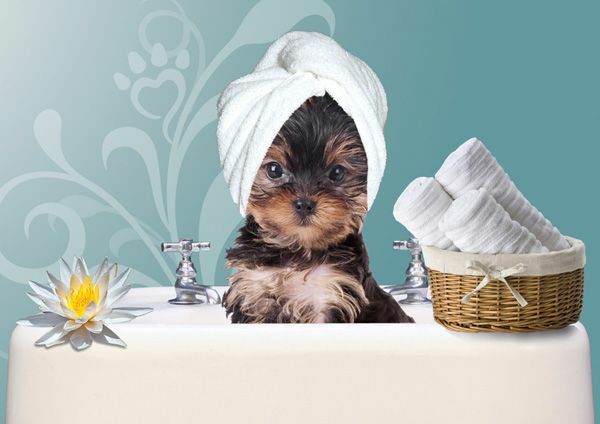 Ongoing visits– Your groomer will advise you on the recommended time in between professional grooms for you puppy. You can choose to have a full groom each visit or you may wish to have a bath and brush through, in between full grooms. Please see the Services and Extra Touches tabs on the menu for more details.